What do you do when you can’t decide which pizza to have? Have them both! But I thought D meant to eat most of them, and then take some pieces back to the hotel. Nope. They were really good, and we just ate ’em up. We wanted to have the Brussels sprout and pancetta pizza again, b/c I have tried to make it and not succeeded in getting its sumptuousness right. 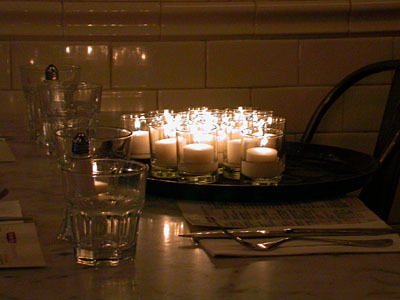 We think there was large-crystal salt on it, and perhaps that the pancetta was drenched, or marinated, in garlic oil. There was a lot of oil on the pizza, but not enough to make it too damp. Lots of sprout leaves, too. I may use too few of them. The pancetta was especially good tasting, and the grade of that meat may be critical to making the pizza taste right. 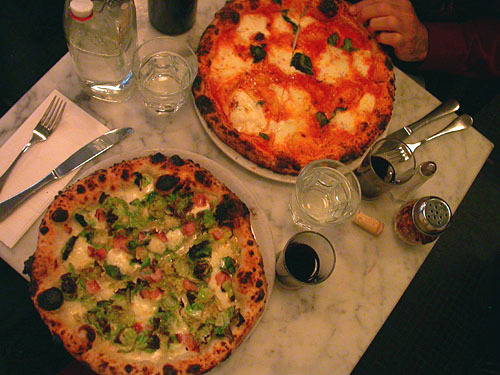 We also wanted to try a Margherita, since we had an “oh THAT’S what the fuss is all about” experience over that pizza at lunch at Delfina back in January. So we are now going around comparing Margheritas. We both thought Delfina’s was better, though this one was very good. 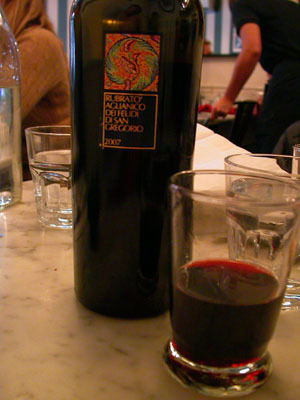 We had a bottle of Rubrato Aglianico dei Feudi di San Gregorio, which was one we had by the glass last December on our first trip to Motorino. We both really liked this wine. D decided to order extra glasses to finish the pizzas with, and we got a Rosso Piceno and a Toscana, both of which we also liked a lot. 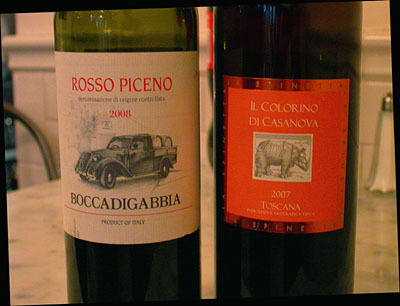 I’d place the Aglianico first, the Rosso second, and the Toscana third, but that’s a very high-quality third place. This was a really early dinner, so we have time to recover before we go to sleep! This entry was posted in Meat as a flavoring, Pizza, Restaurant and tagged Aglianico, basil, Brussels sprouts, fresh mozzarella, pancetta, Pizza, Rosso piceno, tomato sauce, Toscana rosso. Bookmark the permalink.